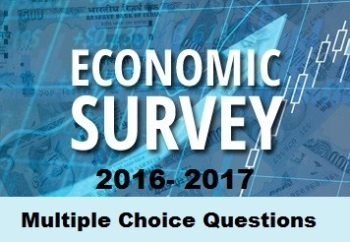 Practice the important IAS questions created from the Economic Survey 2016-17. Such questions might be asked this year also in IAS Prelims Exam 2017. Read, practice and take the most benefit out of this during the preparation of IAS Exam. I. According to Census 2001, 33 million people or 8.1% of the Indian workforce were migrants for economic reasons out of which over 80% of these migrants were male. II. Labour mobility also appears to be low because urbanization rates have not picked up sharply over the years, changing by roughly three percentage points per decade, irrespective of the urban definition used. I. As per the NSS 2007-08 data migrants comprise 29% of the workforce while alternatively; nearly 20% of rural households had at least one out-migrant for work in 2007-08. II. The commuter migration for work across the rural-urban divide is also substantial in India, exceeding 10 million people in 2009-10. Using NSS 2007-08 data separately on migration and worker status, it can be shown that migrants comprise 29% of the workforce. Alternatively, nearly 20% of rural households had at least one out-migrant for work in 2007-08. Third, commuter migration for work across the rural-urban divide is also substantial in India, exceeding 10 million people in 2009-10. Fourth, the slow pace of Indian urbanization is rooted in the demographic divergence between rural and urban natural growth rates and not necessarily in low or stagnant rates of migration. 3. Which of the following states/union territories is the largest recipient of migration in India? The largest recipient was the Delhi region, which accounted for more than half of migration in 2015-16, while Uttar Pradesh and Bihar taken together account for half of total out-migrants. Maharashtra, Goa and Tamil Nadu had major net in-migration; while Jharkhand and Madhya Pradesh had major net out-migration the impact on migration activity on state labour supply is far more uniform. Out migration is a significant share of the working age population, both in the smaller states (Goa, Puducherry, Nagaland, and Chandigarh) and largest states (UP, Bihar, Jharkhand, and MP). For India as a whole the annual net flows amount to about 1 per cent of the working age population. 4. Which of the following states/union territories have largest out-migration during 2015-16? The largest recipient was the Delhi region, which accounted for more than half of migration in 2015-16, while Uttar Pradesh and Bihar taken together account for half of total out-migrants. Maharashtra, Goa and Tamil Nadu had major net in-migration; while Jharkhand and Madhya Pradesh had major net out-migration the impact on migration activity on state labour supply is far more uniform. Out migration is a significant share of the working age population, both in the smaller states (Goa, Puducherry, Nagaland, and Chandigarh) and largest states (UP, Bihar, Jharkhand, and MP). For India as a whole the annual net flows amount to about 1 per cent of the working age population. States like Delhi, Maharashtra, Tamil Nadu, and Gujarat attract large swathes of migrants from the Hindi heartland of Uttar Pradesh, Bihar, and Madhya Pradesh. Kolkata in West Bengal attracts migrants from nearby states of Jharkhand, Uttar Pradesh, and Odisha making evident one of the laws of migration propounded by Ravenstein (1885). I. Gravity model is an empirical observation which finds that the migrant/passenger flows between two geographies is directly proportional to the level of economic activity/population of these two geographies. II. Gravity model is an empirical observation which finds that the migrant/passenger flows between two geographies inversely proportional to some measure of physical distance between the two geographies. III. Geographers were pioneers in using the gravity models for studying the migration and mobility patterns. Gravity model is an empirical observation which finds that the migrant/passenger flows between two geographies is directly proportional to the level of economic activity/population of these two geographies and inversely proportional to some measure of physical distance between the two geographies. Geographers were pioneers in using the gravity models for studying the migration and mobility patterns. Ravenstein in his work tried to systematically study the patterns of migration. Waldo Tobler described the gravity equation as the first law of geography, which states that “everything is related to everything else, but near things are more related than distant things”. Economists have also been using the gravity equation to study and predict both the flows of migrants between different countries and geographies.